Thanks to its rewind system the users can now produce two different print sizes from just one media without any wastage! No need to change the media to print 4x6 or 6x8. Dedicated media allows to get the fastest printing speed, including a new air-cooling mechanism which provides one of the best printing throughputs of the market. 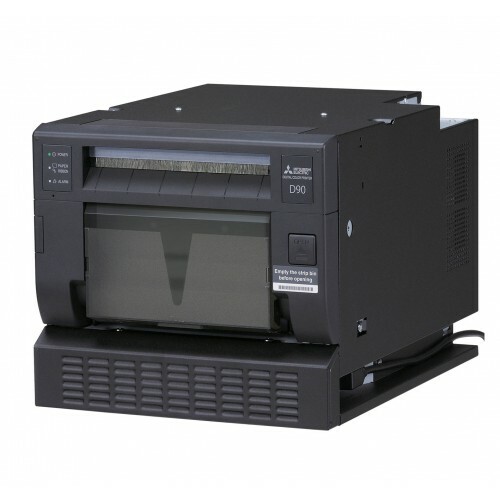 The CP-D90DW-P printer has a NEW PANORAMA FORMAT available in 6x14" and 6x20" (15x36 cm and 15x51 cm) sizes. Click here to view our Panoramic Drop In Template Set formatted for the Mitsubishi CP-D90DW print sizes. Perforated Media provides more printing formats in order to increase printing possibilities. It is available for the 4x6 inch/10x15 cm paper rolls. The perforation is on 2 inch/5 cm from the left side of the paper roll. Perforated Media allows to make the popular square format 4x4 inch/10x10 cm. For the use of this paper on events it is possible the use the left strip for additional content like discount vouchers or branding. When the printer cuts on the 3,5 inch/8,9 cm size instead of the standard 4 inch/10 cm the final output is a Polaroid sized print of 3,5 x 4 inch/8,9x 10,2 cm plus the strip on the left site.